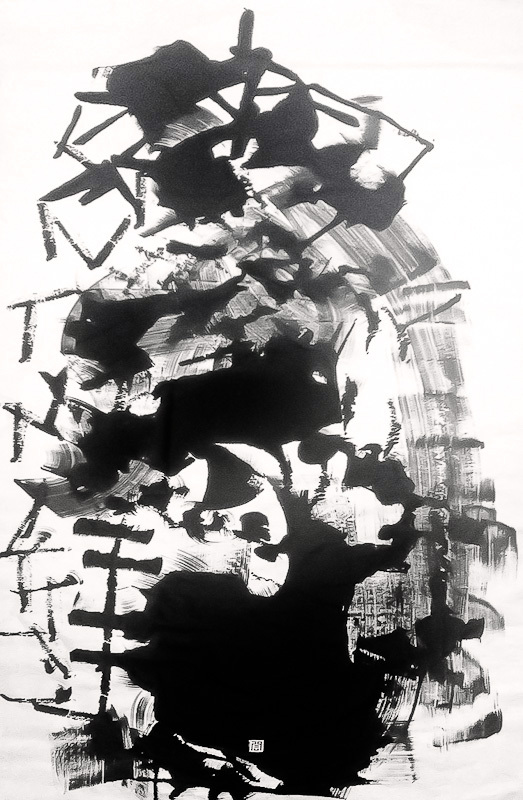 The painting is a contemporary calligraphy with the Chinese characters “天”, “元” and “心”, illustrated in an energetic and contemporary way with grass script and energy generated script that abstractly blends everything into one flow of energy. The word “天”, translated as celestial, or sky, or nature, is on the top. The word “元”, translated as energy, is in the middle. The word “心”, translated as heart or essence, is placed in the bottom, smudged together to illustrate the concealed and contained energy inside the “heart” of the celestial energy, just like how the cosmic energy in the universe contains itself inside our world, while our world is contained inside the cosmic system. The artist’s stamp is cleverly placed inside the “heart” and sunk to the bottom fo the heart, well concealed and stamped in pure white, showing a sharp, sudden contrast in the big blob of black. The stamp not only shows the artist’s wisdom to stand out the stamp by using a contrasting color, but also shows the clever use of negative space proportion and balancing between the extreme elements. Big and black versus small and white, top versus bottom, left versus right, totally in proportion, making the stamp sits there just at the most perfect position to complete the art piece. The stamp also represents the artist, which means the artist is also flowing with the celestial force in nature as well. The momentum of the three words are flowing smoothly, energetically and vigorously from top to bottom in a zig zag pattern, like lightning. It also solidly penetrates and rams into the viewer’s heart. The background shows a circular structure and flow, from solid, rough, strong, bold and rigid lines to a flow of semi-gray tone that is thicker, softer and less rigid, and then back to dark and solid. This pattern represents the flow of nature according to the theory of the ancient astrology in Chinese – the Tai Chi diagram. From the bottom, it represents winter, and transits into spring moving to the left side and up. You can see the “tree” like elements, branches elements, and so on.. which represent wood. As we move up 90 degree, on the left side. it is spring, and we can see a lot of lively stroke which represent growth and life. The top is summer, with heat and energy, shown by the energtic “?”. Then slowly taper to autumn, a smooth and flowing stroke that is less intense in color. Then down the winter again to full black, concealing everything inside the “heart”. The whole art piece is full of energy, flow, balance, rooted from the ancient astrology concept of Tai Chi and explaining how the universal works in one piece of magic.